= I told you. I am a girl! ゴールデンウイーク = Gooruden uiiku = Golden Week has just started in Japan so I will teach you about Japanese holidays in spring. Holidays in Japanese is 祝日 ( = shukujitu) or 国民の祝日 ( = Kokumin no shukujitsu ) = National Holidays. 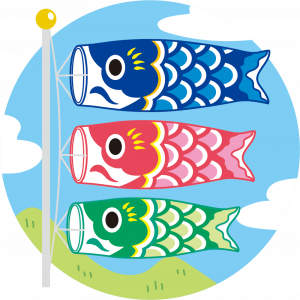 People from older generations call it 旗日 ( = hatabi ) = flag holiday because we fly the Japanese flag in front of office buildings or houses on National Holidays. But we rarely see the flag flying in front of regular houses on national holidays these days. = Ashita wa yasumi desu. = It’s my day off tomorrow. = Sumimasen ga raishuu oyasumi wo itadakemasu ka? = Can I have a day off next week? = Kyuka wo riyou shite ryokou ni ikitai. = I would like to use my vacation time to go traveling. you can’t take many days off if you work for a Japanese company. = Gooruden uiiku chuu wa dokomo konzatsu shimasu. = It’s crowded everywhere during the Golden Week. = Gooruden uiiku ake ni aou ka? = Let’s get together after Golden Week! Compared to other countries, Japan doesn’t have so many holidays. So we have to appreciate these little holidays. = Renkuu wa dokomo konde irukara ie ni imasu. = I will stay home because it is going to be crowded everywhere during the Golden Week. = Kono renkyuu dokka iku? = Are you going somewhere over the long holiday? = No, I won’t go anywhere. Now, let’s talk about May 5th, also known as こどもの日 ( = Kodomono hi )=Children’s Day. We celebrate the well-being of children today but it is customarily called “端午の節句” ( = Tango no sekku) and it was originally for boys. • 午 ( = go) means “noon” and it refers to “May“. 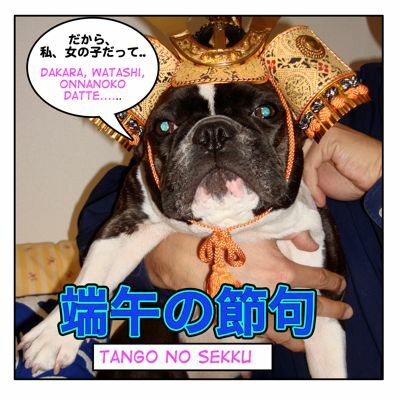 So 端午 ( = tango) means “the end of the season” which means the beginning of the new season. 節句 = sekku means special and important days to have traditional events. OK, let’s take a look at the picture above. = Dakara watashi onnanoko datte (itterudesho) !). = I told you, I am a girl! Note : だから ( = dakara) usually mean “That’s why” “therefore” or “so” and used when you explain some reason. = KInou wa taichou ga yokunaku ichinichi nete imashita. Dakara kurasu ye ikenakatta nodesu. = I was under the weather all day yesterday. That is why I couldn’t go to class. = Kinou kyuuryou ga detanda. Dakara ogotte ageru yo! = I got paid yesterday. So I’ll treat you. But we also use it when we want to add stress to a sentence. (That’s why) I told you! Also we use it when we repeat something, rephrase what we meant, or bring up some obvious fact that the listener doesn’t get. = Dakara watashi wa ikitaku naino! = I told you, I don’t want to go! = Dakara ore wa omae no koto ga sukinandayo! = I told you (or Isn’t it obvious?/ You should know) I like you! 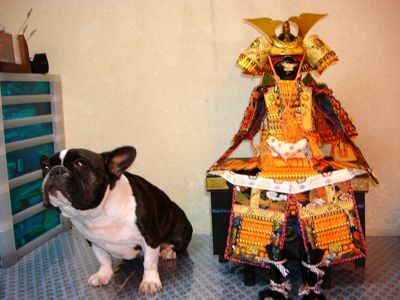 or 五月人形 ( = gogatsu ningyou) the literal meaning is May Dolls, they are traditional military commander dolls. 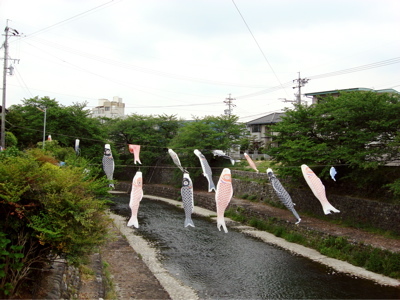 or raise 鯉のぼり ( = koinobori )= carp shaped flags outside of your house if you have a boy in your family. (Usually only when their boys are little.) 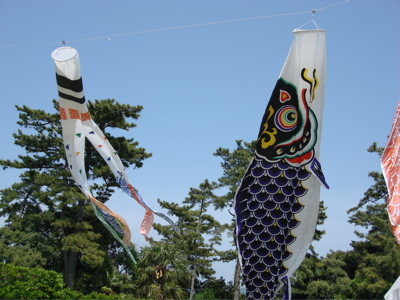 because 鯉のぼり ( = koinobori) = carp-shaped streamers represent success and strength. Sometimes they hung them horizontally along the river. = They seem having fun swimming. = Eating something with gusto. Can you read the kanji 端午の節句 ( = Tango no Sekku)？ on the package below? 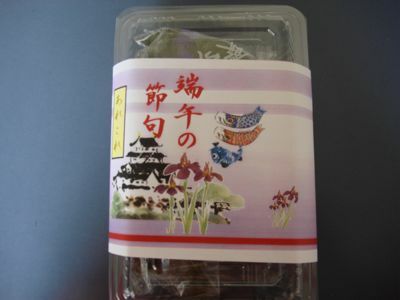 As you can see in the picture 菖蒲 ( = shoubu) or アヤメ ( = ayame ) Iris flowers are symbols of May. Traditionally we bathe children in a bath with iris leaves hoping that they grow healthy. 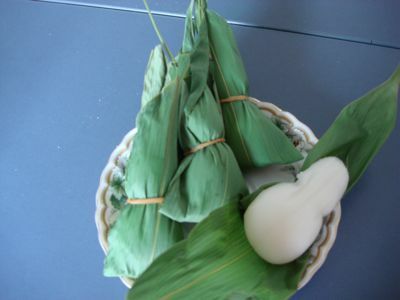 They stuff 餡 = an= sweet beans paste inside of かしわ餅 ( = kashiwa mochi). = Kotoshi no GW wa doko ye ikou kana. = I wonder where I should go during the GW this year. I know kimchi, but can’t find the meaning of kuppa anywhere? Is it rice in soup? クッパ？ It’s rice in soup like Korean risotto! I also have a question: Are there any differences between 眠る and 寝る. Or are these words totally synonymous? I will make a lesson on that subject for you sometime. I am in middle of making another request lessons so please wait! Oh, thank you! I am looking forward to your next lesson. Meanwhile there is still more than enough for me to explore on your amazing site! Thanks a lot for your work! I also confuse with that nemuru and neru… ? This is an old comment but I already made a lesson for Jetta years ago. The difference between neru and nemuru. minna ga deru deshou? ?….does it mean that everyone is showing up or participating?? Ex.この問題は試験に出る= kono mondai wa shiken ni deru = This question will be in the exam. Now it is hard to translate just one sentence 皆が出るでしょう= Mina ga deru deshou because it needs an object. Hope I answered your question.